As you can tell from our 2016 Miami Art Week/Art Basel itinerary compared to that of previous years (our 2015 itinerary, for example), the past few Basels have become progressively more saturated with satellite fairs and events. Therefore, we've had to transition our strategy little by little from trying to see and do everything to selecting one event per day we absolutely couldn't miss. It's for the sake of our sanity, really. Super 8 hotels are getting a full-blown makeover where the kitschy art that previously decorated their walls (think Bob Ross-like landscapes) is being replaced by iconic black and white photos representative of each hotel's location. In a genius and super cheeky move, Super 8 put the paintings from their old look on display for the evening and entered guests in a lottery to win a piece of their choice, allowing winners to literally take the art down from the gallery walls. We were amped about this event from the moment we received our invitation because it is extremely interactive where other Miami Art Week events are not at all. Unfortunately we didn't leave with our very own canvas of Super 8 history, but we did discover a hidden talent for painting "happy little trees". A Bob Ross-certified instructor led us and handful of other guests through recreating a mountainous landscape in the '80s art icon's signature style. We received a lot of positive feedback and trash talk from the other participants (all in good fun) for our art. Overcome by uncharacteristic bravado, we even pitched our artistic talents to the Super 8 executives as we said our goodbyes. And, while we're probably not ready to decorate their beautifully redone rooms, we're very impressed that our painting turned out as well as it did. What do you think? In a highly anticipated move, Time Out Miami released the very first print edition of their new quarterly Time Out Miami magazine in time for Basel. To celebrate, they hosted an incredibly fun and free party at the ToeJam BackLot in Wynwood. What we loved most about the event was its casual vibes, a rare find during Miami's most pretentious time of year. We perched up with a cold Stella cider (another elusive Miami find), first inside the lot's bus and then on the porch of the "boom shack" to watch the crowd, enjoy the live music and relish in our great weather. The party also gave us the opportunity to catch up with our foodie friends who were scattered around the lot admiring the oversized canvases of art, indulging in fare from the onsite food trucks, and wondering—like us—about that neon flamingo sculpture that someone "drove" into the lot mid-party. Between its laidback ambiance and the outpouring of local love (particularly aimed toward Time Out Miami editor, Virginia Gil, and her hard work), the Time Out Miami magazine launch party was a local's Basel dream. 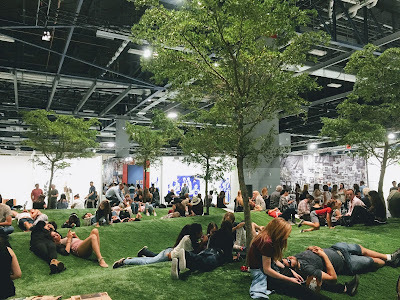 Thanks to all the distractions—the celebrity sightings, the fancy parties, the overabundance of champagne, and the infinite amount of art fairs—it is easy to forget the reason for the season is Art Basel at the Miami Beach Convention Center. As such, every year we have make it a point to stop by no matter what. It was a little challenging to fit it in this year amidst our many obligations but mama, we made it! Per usual, it was an odyssey of endless wandering amidst a maze of people and art. We didn't have a clue where we were half the time, reorienting ourselves only when we found that we were walking down a familiar corridor. It was a blur of art, most of it too abstract or bizarre for our taste, but every so often one grabbed our attention and we would spend a few minutes basking in its glory, battling hordes of people trying to get their picture taken with it. Ever the rule followers, we were hesitant to follow suit but were encouraged by a friend's valiant cry of, "They love it when you take pictures of their sh**!"